Hello once again. Time for another issue, even though it seems the March one just came out. Still, no rest for the wicked and so we soldier on towards another month full of excellent rock music. 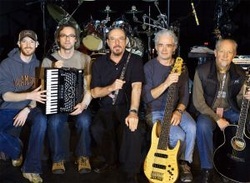 This issue's featured band is Jethro Tull. Yes, I know some people will say they belong in the progressive section, but I've always felt Jethro Tull never trully belonged there and released only a few progressive albums and otherwise stuck to folk rock, hard rock and blues rock. But due to this aspect of their music, I've decided that Jethro Tull should act as the featured band for both the regular rock and the progressive rock sections. In addition to the featured artist segment, there's also a Jethro Tull review and an interview with former member Andrew Giddings, which provides for a thoroughly entertaining read. I hope you enjoy reading this issue as much as we enjoyed creating it!